RK GROUP Holdings (M) Sdn Bhd has sold all of the residential units on offer at its pioneer project, Axis Atrium, months before work on the integrated project due to be completed. Axis Atrium is a combination of residential units, offices and a shopping mall in Pandan and Ampang in Kuala Lumpur. Group managing director Datuk Roslan Khalid said the project is 70 per cent completed and will be fully operational by year-end. "We started this project in 2004 and have come a long way. Suffice to say that this project is very much like my own baby. We will complete this project before moving on to the next one," he said after revealing Carrefour as the anchor tenant for its shopping mall yesterday. The company had marketed its residential properties in Singapore to woo foreigners. As a result, 20 per cent of the 866 property units were bought by overseas buyers from countries, including Poland, for a number of reasons, especially for investments, he said. However, Roslan did not elaborate on his future plans for the family-run business which he formed 10 years ago after being an architect for several companies for the last 30 years. "We plan to increase our landbank but we are unable to disclose the areas that we are looking for at this moment which will also include outside of Klang Valley. "We hope to finish this project completely before moving on to the next one. The Axis Atrium will indeed serve as a reference to us," he said. Roslan started the property company six years ago with only three staff. He now has 50 people and a subsidiary which does construction and property management. He bought the Axis Atrium land, which was previously an oxidation pond, for less than RM1 million some 15 years ago. "My lawyer thought I was crazy when I made the purchase and so did the banks who were lending me the money for the project," he said. Roslan said Axis Atrium, which has a gross value of RM270 million and a total development area of 1.8 million square feet, is set to become one of the significant landmark in Pandan and Ampang areas. Putrajaya Holdings Sdn Bhd will call for tenders for projects worth over RM1 billion this year as it is bullish on the property market in Putrajaya. Chief executive officer Datuk Azlan Abdul Karim said the tenders are to build four office towers worth a combined RM700 million, residential properties and office blocks. Tenders for the 14- and 15-storey office towers with one million sq ft of built-up space will be called in the next five months. Companies like Ahmad Zaki Resources Bhd (AZRB), IJM Corp Bhd, Sunway Holdings Bhd, UEM Group and Ireka Corp Bhd are set to bid. "When you have the government as the anchor tenant here, there are always spin-offs. 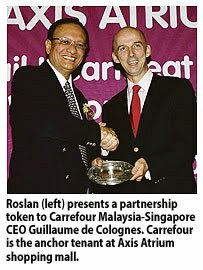 There is support from the private sector and government agencies," Azlan said. "We will lease the four office towers first and sell later. 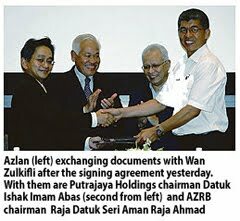 We have prospective buyers," he told Business Times after the signing of an agreement between Putrajaya Holdings and AZRB's construction arm, Ahmad Zaki Sdn Bhd (AZSB), in Putrajaya yesterday. As Putrajaya is due for a cybercity status, more multinational companies (MNC) are expected to step in. "The government wants Putrajaya to be a green city. This will attract more MNCs and local private sector companies as well as foreign firms. "But for Putrajaya to go green, we need a monorail. I hope the government will have a budget to build a monorail under the 10th Malaysia Plan. That will help boost activities in Putrajaya," Azlan said. According to Azlan, Perbadanan Putrajaya, the city's local authority, has sent in a request to the government. The matter is still pending. On the signing with AZSB, Azlan said it will build a waterfront commercial project fronting the Putrajaya lake for RM126 million over the next two years. AZSB will construct three blocks of three- and five-storey buildings comprising 106 units of retail lots and shop offices. Azlan said the average selling price per unit is around RM500 per sq ft and more than half have been booked. The Mayland Group is launching this Saturday phase 2 of its Palazio serviced apartment project in Mount Austin, Johor, as it is upbeat on the market. Prices of residential properties in Johor are rising and demand for studio units and 3-bedroom serviced apartments is growing, said Malaysia Land Properties Sdn Bhd head of leasing Eddy T.P.Tan. "When we launched phase 1 of the project last June, we were selling at about RM200 per sq ft. Now the highest unit in phase 2 is pegged at RM280 per sq ft," Tan said in a recent interview with Business Times in Kuala Lumpur. The entire project has six 14 to 21 storey residential towers worth RM300 million. Mayland is launching the towers in three phases. Tan said more than 80 per cent of Phase 1, which has 668 studio and 3-bedroom serviced apartment units was sold in six months. A bulk was bought by existing property owners in Johor, and investors from Singapore, Indonesia and Kuala Lumpur. Many are repeat customers who bought previous properties by Mayland and know the potential investment opportunities, Tan said. "We are confident of selling 80 per cent of phase 2 by December. We are one of the pioneers in Johor to offer studio units of this size. Mayland is also the only developer in Mount Austin to offer high-rise residential units," he said. Phase 2 comprises 624 studio and 3-bedroom serviced apartment units in two 17-storey towers, worth RM100 million. Dubbed Palazio Maple & Mulberry Tower, each unit will be priced from RM109,000 or between RM230 and RM280 per sq ft. The size of the studio units range from 420 sq ft and the serviced apartments from 1,095 sq ft.
Tan said the key selling point for Palazio is its location, which is close to Johor Baru city centre and the Austin Hill Golf Course. "We will invest a lot on landscaping. There is a 1.2ha lake fronting one tower in phase 2 and we will improve the area with jogging tracks and covered walkways. "We are also building a 5,000 sq ft full-equipped clubhouse and two swimming pools between the two towers. We want it to be as attractive as possible for buyers," Tan said. Mayland plans to launch phase 3 with two 21-storey towers on a carpark podium by end-2010. The Palazio is Mayland's fourth property project in Johor since it entered the market in 2001. MALACCA: Hatten Group, which is responsible for the Dataran Pahlawan and Hatten Square projects, are confident of achieving RM300mil sales for its high-end Hatten Square suites. Hatten Group’s chief executive officer Group Datuk Eric Tan said the company was targeting local investors based on the success of its first phase where more than 80% purchasers were Malaccans. “With the launch of Phase 2, the company aims to generate RM300mil in sales,” he said, adding that the sky bridge between Hatten Square and Dataran Pahlawan shopping complex will be opened on July 2. He added the project would help spur development of the Banda Hilir area into a foremost tourist centre. Hatten’s latest project include the development of a 22-storey building which will house a four-star hotel with 750 suite rooms along with 200 retail units and 1,500 parking bays. PETALING JAYA: Axis Atrium, the latest mall in the Pandan and Ampang area that is set to redefine the retail, dining, exhibition and entertainment landscape in the vicinity, has welcomed Carrefour as its anchor tenant. Axis Atrium and Carrefour held a media briefing and preview of the mall yesterday. In a statement, Axis Atrium said the 218,000 sq ft mall, which opened on March 25, was expecting more tenants to open business next month. Axis Atrium is the first phase of the Axis Pandan urban redevelopment project undertaken by Reliable Capacity Sdn Bhd, a wholly-owned subsidiary of developer RK Group Holdings Sdn Bhd. The project, which had a gross development value of RM270mil, will have a total development area of 1.8 million sq ft and is set to be a significant landmark in the area. The integrated Axis Pandan development would comprise a 33-storey, 384-unit condominium dual-winged Axis Residences tower; a 41-storey, 348 units of Axis Crown serviced condominiums; 154 units of two-storey duplex small-office home-units and Axis Atrium mall that would serve these commercial and residential development as well as a rich and established catchment population, it said. According to RK Group managing director Datuk Roslan Khalid (pic), the mall would have a catchment population of 1.35 million within a 15-minute drive radius, contributing to its potential as the top retail venue in the Pandan and Ampang area. “Based on research findings, Axis Atrium has approximately 300,000 residents who live within a five-minute drive radius. “From a retail perspective this makes Axis Atrium a hot property. Coupled with the exciting concept, unique design and enthusiastic response from retailers, shoppers and the local community, we believe we have a winner in this mall,” he said. PETALING JAYA: Talam Corp Bhd has entered into a supplementary settlement agreement with the Menteri Besar Selangor Inc (MBI) to settle the balance debt amounting to RM150.61mil it owes MBI, by way of disposal of land (settlement assets). It told Bursa Malaysia yesterday that the agreement was done on April 9 and that the assets were located in Bukit Beruntung 2. It said the balance debt was from the total of RM391.98mil the company originally owed MBI of which RM241.36mil was settled and announced on March 12. It added that the proposed settlement would reduce its bank borrowings and hence its interest cost, and settlement of its debt owing to MBI in full. The proposed settlement would reduce the company’s gearing ratio from 1.92 to 1.49 times (based on audited statements as at Jan 31, 2009). Together with the principal settlement agreement, the company’s gearing ratio would be reduced from 1.92 to 1.32 times (based on audited financial statements as at Jan 31, 2009). It said the proposed settlement was estimated to be completed in six months from the shareholder’s approval or settlement of the encumbrances by MBI whichever was later.